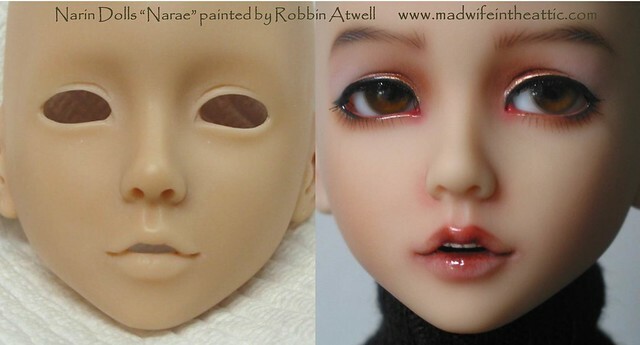 I recently painted this face for my friend, Marianne (the AIL Alice in the previous post is also her doll). She is an MSD so she is about 17″ tall. This sculpt is called “Narae” and her sculptor is a talented Korean artist called “Bimong.” I’m not sure when Narae was introduced, but she is one of the dolls that drew the attention of the fashion doll collectors and turned them into BJD devotees–And, quickly made BJDs a phenomenon in the world of collectable dolls, play dolls, and art dolls. She, along with the Unoa girls, were about the same size as many popular fashion dolls (so they could share some clothing) and they broke away from the anime aesthetic that didn’t speak to collectors of realistic dolls. Although there have been a stunning number of new artists and companies entering the doll market, Narae is still beloved despite all the competition for our doll love and doll funds. This particular doll was made several years ago when Bimong’s dolls were marketed in the US through a company called Dollfair. She is a tan French resin which was a particularly lovely resin — very photogenic. Over time, many of these resins changed color. If this particular doll has changed, she is still quite lovely. Unfortunately, you can not buy a new Narae at this time… Dollfair had major difficulties — their customers and the artists they represented were cheated. There was confusion, frustration, and law suits. Bimong started marketing his dolls himself, then he contracted with a company called D-Storic to produce his dolls. His relationship with D-Storic ended at the end of 2012 and D-Storic is struggling to complete a flood of orders they received and they are having problems with customer service and quality. At some point in the future, most people expect Bimong to begin marketing his dolls himself again, but I haven’t seen any projections for when that might happen. Poor Narae has had many ups & downs! For the time being, the only place to find a lovely Narae like this one is on the secondary market. She has always been a very popular doll, so there are a lot of them out there in the world. If you’re shopping for a Narae, be sure to find out when she was made and get lots of current photos to determine if there has been any objectionable color change. Marianne asked for Narae / Lily to be painted so that she would look good in the blunt cut wig in the next photo. She wanted her face paint to play up any Asian aspects of her sculpt. I wasn’t really successful in that respect because this sculpt has a deep eye crease. Bimong sculpted another version of the Narae face with less eye crease. I tried to emphasize her eye-liner and highlight the area above her eye so as not to overplay the eye-crease. Without a modification, I couldn’t change her look a lot. We were both happy with her in the end. 24 Jun	This entry was published on June 24, 2013 at 3:14 pm. 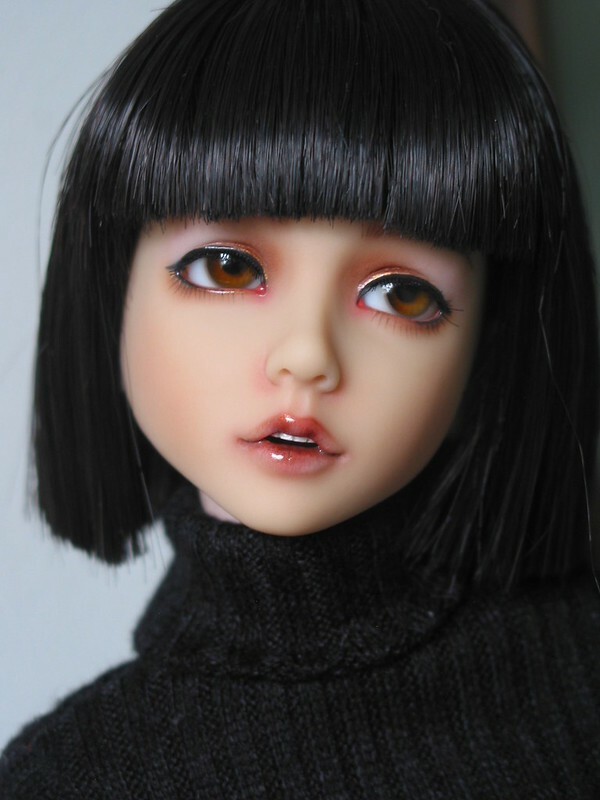 It’s filed under BJD Faceups, Doll Making and tagged ABJD, Bimong, BJD, Faceup, Narae, Narin, Painting, Robbin Atwell. Bookmark the permalink. Follow any comments here with the RSS feed for this post. I have a Narae head but need a body, any idea where to find one?